Brother HC1850 is priced high for the features on board. There are better alternatives available from Brother itself. 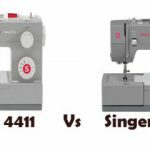 CLICK HERE to read what other buyers say about this sewing machine. The user manual comes in English and Spanish. There is also an instructional DVD included. The user manual is easy to read and understand. 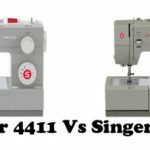 This sewing machine works equally well for beginners and intermediate users. It comes with 130 built-in stitches which include 55 stitches for monogramming. Monogram stitches include some special characters as well. The detachable working table gives you the freedom required while working on larger projects. 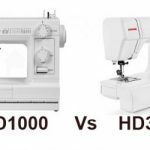 Weighing at just 10.1 pounds, this sewing machine is pretty light, so portability is never an issue. Quilters will love the drop feed on board. You can operate Brother HC1850 with and without the foot pedal. You can control the stitching speed with the slider in front of the machine. It comes with 8 one-step auto-size button holes. The LCD screen enables you to see the stitch and length chosen. LCD screen will also tell you which presser foot to use with a selected stitch. 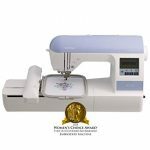 Basic sewing is seamless on this machine, beginners will love this. There are 3 sewing speeds on this machine, which you can control quite easily with a slider. The decorative stitches come out perfect on this sewing machine. The needle threader and automatic lifter will come handy for aging users. 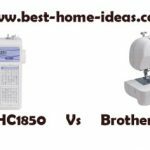 Brother HC1850 comes with a wide range of accessories as well. The reverse button just sews in reverse, there is no reinforcement of stitches, which I would have loved to have. Monogram doesn’t really come out perfect with light fabrics, it works perfectly well with heavier fabrics though. Another thing I would like to point out is that, this is not a great machine for quilters, even thought the manufacturers say otherwise. 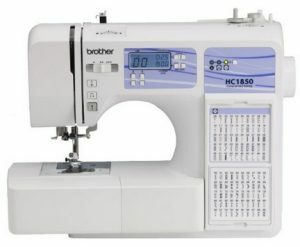 Overall, Brother HC1850 is a great sewing machine for beginners and intermediate users. I won’t recommend it for advanced users as it lacks quite a lot of features that an advanced user will look for. It is slightly priced high as well. Another alternative you can consider is Brother DZ2400. It has a lot of features that this one doesn’t have. Sometimes DZ2400 is few dollars cheaper than HC1850. The price keeps fluctuating according to shopping seasons, so compare the prices before you buy. If DZ2400 costs less, always go for it.